Trojan Firearms is a company that is probably more know for their pistol caliber carbines. Besides this, they also make some other bits and pieces for AR style rifles. That leads us to the new single stage TFA-15S Flat trigger assembly. They also manufacture a curved version for those that don't like straight triggers. Trojan supplied one of each for review, another reviewer was sent the curved version. Besides being flat, this trigger has some nice touches. First off, it is a cassette style drop in. So all you have to do to install it is remove the safety and the old trigger, then it drops right in. The TFA-15 uses a shoulder bolt mounting system unlike any drop-in trigger I've seen. This eliminates the need for anti-rotate pins and for trigger pins period. Just install the screws, on each side, where the trigger pins would sit and tighten down. They also supply star washers to go on these screws. I don't think they are needed and they could possibly mar the finish around the pin holes. Another really nice touch, is the adjustment lock screw. The lock screw puts pressure on the adjustment screw so the trigger adjustment remains consistent even after long periods of use. The trigger also has 2 setscrews facing downward to lock the trigger against the mounting bolts. I like being able to adjust the pull weight of triggers. The TFA-15 uses the somewhat standard single screw adjustment method. Screw the adjustment screw in for a heavier trigger pull, and out for a lighter one. But, with the single adjustment screw, comes reset adjustment also. Basically when you lighten the trigger, the reset becomes lighter also, or not as positive. If you adjust the trigger too light, you don't get any reset on the trigger and have to reset it manually. I was able to adjust the trigger from 2.5 lbs to around 7 lbs. But to get 2.5 lbs, I had to measure the pull weight at the tip of the trigger. So where I normally rest my finger, it came in at 3.5 lbs. 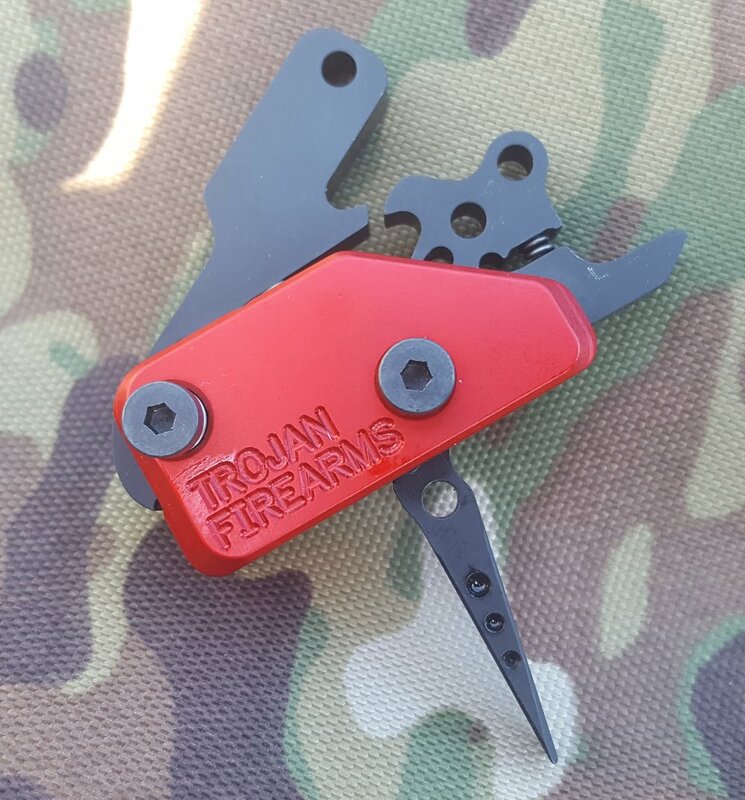 The first trigger that Trojan sent didn't pass a safety check, it would fire the hammer when the safety lever was moved to the fire position. Trojan immediately sent me a new one. They even called me to help figure out the problem. Also note worthy, the TFA-15S has a longer trigger bow length. The bottom of the triangle shaped shoe sets just slightly above a standard trigger guard. I really liked how it rested on my finger when using the lower portion of the trigger. After using the TFA-15 for some time now, I really like the straight shoe. As noted above, I have it adjusted almost all the way down. When you pull the trigger really super slow, you notice what feels like creep, but is actually the sear sliding on the hammer. There is virtually no creep! Because I have the pull weight tuned down, the reset is a little spongy when releasing the trigger slowly. If I bump up the pull weight by 1/2 lb, the spongy feel basically goes away. Even though you can feel the sear sliding, it is so smooth. It somewhat reminds me of a 1911 trigger. I also couldn't distinguish any over travel of the trigger. Plus, if pulling the trigger at a somewhat normal pace, the pull just feels crisp (like breaking a glass rod). Yes, I have broken a glass rod to know what it feels like. Every time I review an AR trigger, I try it with my .22 lr conversion. The TFA-15 is one of the few aftermarket triggers that actually worked! Most don't have enough hammer energy to set off the rimfire cases consistently. Another great feature of this trigger is the ability to cycle the action while the safety selector is in the "safe" position. Hey, why not be able to load a round with the safety on. I really liked how the trigger arrived with a super smooth pull. Other triggers I have used take some break in until they felt like this. 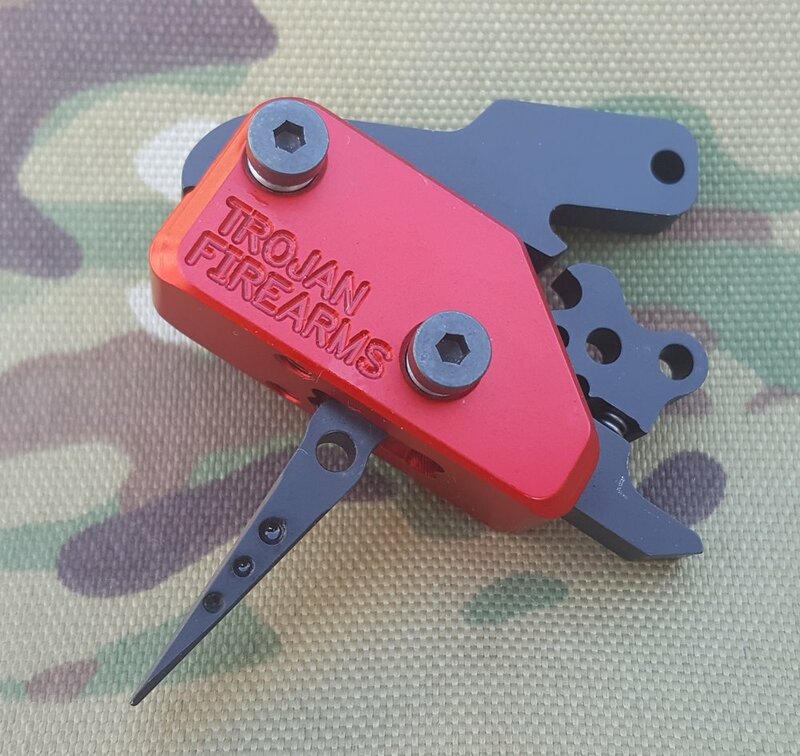 If you are looking for a decent drop-in trigger system, go look at Trojan Firearms. Their customer service is top notch, and they manufacture more than just triggers. Secondary safety catch for increased reliability against accidental drops. Can cycle action while on "safe"